Introduction: Every once in a while a new fishing technique comes around that changes the very way people fish, just think about techniques like drop shotting or shakey head for example. This season a technique known as Spybaiting has gained attention here in the U.S. and leading the charge is a company from Japan called DUO Realis. DUO‘s Spinbait 80 is a new twin propped hardbait designed specifically for this finesse technique. The Spinbait 80 was created by DUO‘s top designer, Mr. Adachi, who we met a few months ago at ICAST 2013. Like DUO‘s other products the Spinbait 80 exhibits a familiar styled fascia and plenty of attention to detail. We got the lowdown about this bait and the spybaiting technique from David Swendseid of DUO Realis USA. The technique has been used on famous Lake Biwa for years but is not exclusive to the lake, in fact there are reports of Japanese anglers throughout the country modifying their existing baits with props during the infancy of this technique. Lures like the Spinbait 80 are designed to emit plenty of turbulence when fished slowly and exhibit a very natural baitfish profile. Most of us here in the U.S. see prop baits and think topwater but the Spinbait 80 is more like a bladed jerkbait. Though it has a very small 3 1/8″ length it is designed to cast very far and weighs in at 3/8oz. and is designed to fall in a horizontal fashion. After the bait is cast anglers can count down and start retrieving once the lure has reached the desired depth. This lure is designed to be fished with ultralight lines and anything larger than 5lb test is enough to drag the lure downwards and alter the intended action. Retrieved slowly the lure will roll slightly and tightly wobble as the blades rotate. This isn’t a lure that will rattle loudly or sweep side to side aggressively to call fish from afar, instead it is designed to draw strikes by fish that are close by and can see it swimming tantalizingly in the water. The subtle action is ideal for ultra-clear water where traditional techniques simply don’t work. In our initial testing we found this to be true and the lure was effective in clear Northern California lakes but we have not yet been able to catch fish on this bait in heavily stained water. Though our field tests are not yet complete our initial inspection and bait autopsy are. In the lab we found the lures were very consistent and regardless of finish or whether the particular lure was transparent or opaque each and every one of our test lures were all without blemish. The attention to detail on these baits rivals other premium Japanese lures and yet the company retails them for a reasonable $13.99 each. That may sound like a lot for a lure of this size but compared to the competition this price is quite competitive. We found the finishes on the Spinbaits to be quite abrasion resistant and each lure, though compact, felt very solid. In the tank the lure sinks quickly and evenly thanks to proper weighting from two lead weights positioned strategically in the belly of the lure. The lure also features an internal fixed ballast that helps keep the bait perfectly positioned in the water as it is slowly retrieved. Thought the bait may look like simply like a miniature jerkbait a closer inspection of the body reveals angles on the underbelly that help the bait deliver that subtle shimmy as it tracks back in the water. The bait is armed with two treble hooks and the propellers and line ties are all secured into place with long screws which can be tightened or loosened by hand. When we cut open the Spinbait we got to take a closer look at the internal fixed ballast design as well as the chambers that hold the weights firmly in place. Nothing moves inside this bait and the tolerances are superb. The belly hook is held in place with a wire loop that is anchored firmly between the dual weights. The overall design is simple and elegant, something we can appreciate in a lure as you want to reduce your points of potential failure. Part of the allure of fishing the Spinbait 80 is that you can effectively target fish in crystal clear water, something that is a challenge even for experienced anglers. 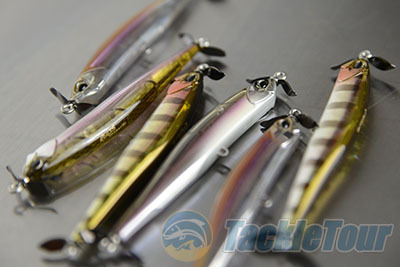 This bait definitely gets small fish to chase but it is designed to draw strikes from trophy class fish as well. Anglers in Lake Biwa Japan have caught many fish larger than 10lbs. with this lure and technique and David has already done the same on the Columbia River and also found the technique deadly effective for smallmouth as well. Because ultra-light lines like 4 and 5lb. test is ideal for this technique a spinning outfit is preferred. This will allow you to cast the lure further. Because the hooks are exposed you will want to make sure to keep the bait moving, albeit slowly, to prevent it from hanging up with structure. As you can imagine getting hung up in deep water with 4lb. line and a 13 dollar lure at the end of your line is no fun at all. The slow (and I mean slooooow) retrieve may seem brain numbing at first but the second you hook up any decent fish the fun begins and the ensuing battle on light line will really get your heart pumping. Now that you have seen this bait inside and out stay tuned for our complete review of the Spinbait 80 or tie one on yourself and see what this new technique is all about. Will the art of Japanese “supaibeiting” or what we call Spybaiting become as big a trend as some of the other finesse techniques that have crossed over? Only time will tell, but for now Duo is poised to support the growing demand with their lineup of Spinbait 80 lures which are just now starting to become available stateside. Share the post "Spybaiting Media Spotlight #3: Tackle Tour：Spinbait 80 and the Art of Spybaiting(USA)"